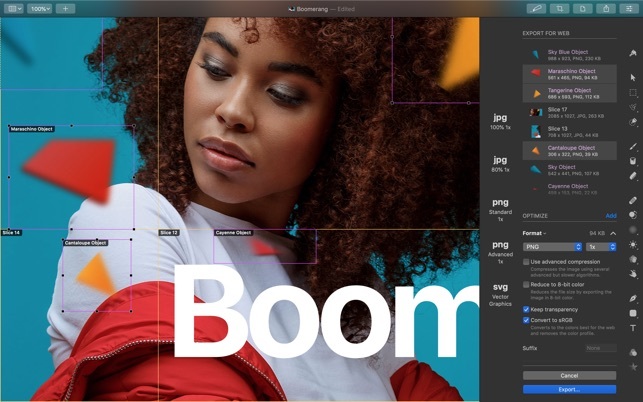 Vilnius, Lithuania – The Pixelmator Team today released Pixelmator Pro 1.3 Prism, a major update to the award-winning Mac image editor designed to make powerful professional tools accessible to everyday users. The update introduces a range of great new features – such as layer color tags, filtering and search, clipping masks, and quick opacity and blending controls – that make creating advanced illustrations and designs easier than ever before. This update also brings clipping masks, allowing users to clip the contents of one layer to the outline of another. This is an essential tool for many digital artists and designers, and makes it possible to create perfect masks using existing objects in a design. What’s more, in Pixelmator Pro, clipping masks can be created from any layer at all – whether it’s an image, some text, a layer group, or even a nested shape, allowing unrivaled levels of flexibility. Founded in 2007 by two brothers, Saulius Dailide and Aidas Dailide, the Pixelmator Team develops powerful image editing apps for Mac and iOS. The team’s apps have been honored with multiple Mac App of the Year awards, an iPad App of the Year award, an Apple Design Award, and many others. Pixelmator for iPad was featured at the Apple Special Event in October 2014. All Material and Software (C) Copyright 2007-2019 Pixelmator. All Rights Reserved. Apple, the Apple logo, Macintosh, iPhone, iPad, and macOS are registered trademarks of Apple Inc. in the U.S. and/or other countries. Other trademarks and registered trademarks may be the property of their respective owners.